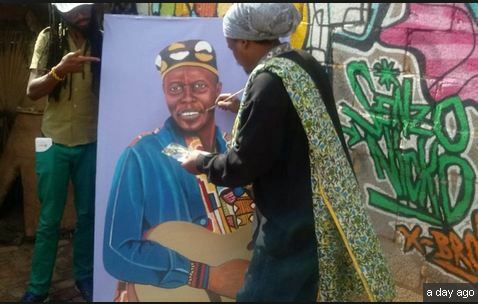 South African artist Lebani Sirenje, popularly known as Rasta, has done a portrait of late Zimbabwean jazz legend Oliver Mtukudzi, despite calls on social media for him to not pick his paintbrush up. Rasta has risen to infamy over the past couple of years for his paintings mostly of prominent deceased South Africans which don’t really resemble them or don’t look like them at all. Recent examples include the late Nelson Mandela, Winnie Madikizela-Mandela, Jabulani ‘HHP’ Tsambo and Linda ‘Pro Kid’ Mkhize. Even very-much-alive President Cyril Ramaphosa has not been spared. Mtukudzi died at the age 66 in Harare, Zimbabwe and predicting that he’d do a portrait, social media users pleaded that Rasta leave him alone. But, when something is your thing, it’s your thing. However, the debate on the matter is still on going.